It is the first verse of ‘Once in Royal David’s City’ sung by a solo treble voice that traditionally opens the church service, Nine Lessons and Carols. This version replaces the voice with the beautiful sound of the cornet. ‘Past Three O’Clock’, written by George Ratcliff Woodward, is a jolly carol not heard very much these days. Woodward, born in 1848, was a euphonium player. The band lets its hair down next with ‘Jingle Bell Rock’ followed by a complete contrast with ‘Mary’s Boy Child’. This was the Christmas song in the year 1956 and was recorded by Harry Belafonte. The dance music ‘Santa Claus is Coming to Town’ was written by J F Coots and first recorded by Benny Goodman’s orchestra in 1935. The carol ‘The Holly and the Ivy’ has been sung for hundreds of years and has its origins in pagan times when sprigs of holly and ivy were taken indoors during winter to ward off evil spirits. The traditional song ‘The Zither Carol’ is said to be Czech in origin and nowadays the arrangement by Sir Malcolm Sargent is the one most widely used. The cheerful lilting song ‘Good Christmas Men, Rejoice’ follows and it was John Mason Neale who translated this German carol from the old Latin version around the middle of the 1800s. It is also known by its Latin name ‘In Dulci Jubilo’. ‘Who is he in Yonder Stall?’ is normally only sang at Christmas time but that was never the intention of the writer Benjamin Hanby (1866) as each verse of the song is a mini biography of Jesus’s life from his birth to the Crucifixion. ‘Christmas Swingalong’ is an energetic dash through songs like `Winter Wonderland’, ‘All I want for Christmas is Me Two Front Teeth’ and `Have Yourself a Merry Christmas’. Three weeks at number one in 1976 was the song ‘When a Child is Born’ sung then by Johnny Mathis and ever since this has been a popular song during the festive season. Two well known carols follow, ‘The First Nowell’ and ‘Away in a Manger’. Away in a Manger is ideal for children’s voices and is sung by junior choirs the world over. Jingle Bells’, originally known as One Horse Open Sleigh, was published in 1857 by James Pierpont and is the most widely sung Christmas song ever. `The Calypso Carol’ is a catchy number allowing the listener to savour the music of the Caribbean. Almost 200 years ago Franz Gruber wrote the carol `Silent Night’. The story is that the church organ in the Austrian town of Oberndorf was damaged and found to be unplayable on Christmas Eve so Franz wrote this lovely carol to be sung in that year’s midnight service. Next we have `Mistletoe and Wine’ which became a hit for Cliff Richard during the Christmas period of 1988. This was his 99th single and his 12th UK Number 1 although it had been sung with slightly different words two years earlier on TV by Twiggy in the musical ‘The Little Match Girl’. After the two songs ‘Good King Wenceslas’ and ‘Angels from the Realms of Glory’ we are ‘walking in the air’ with the title song from the film ‘The Snowman’. ‘Ding Dong Merrily on High’ was originally a dance appearing in a Dance Book written by Jehan Tabourot (1519-1593). The words for the song, written by George Rattcliff Woodward, followed many years later and Ding Dong Merrily was published in 1924 in The Cambridge Carol Book. Traditionally sung at the end of most carol services ‘0 Come All Ye Faithful’ is our penultimate track before we go swinging along with ‘Three Kings Swing’ a modern version of the kings’ march from L’Arlesienne Suite by Georges Bizet. This version was recorded live in the Salvation Army Hall in Sittingbourne during November 2006 and it gives the listener all the thrill and excitement of the band playing music in a live situation. 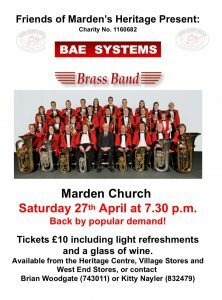 BAE SYSTEMS Brass Band plays music for sheer enjoyment and this certainly comes through in the band’s live concerts. A professional performance by musicians receiving no monetary awards, they only wish to keep music a living experience. Venue : St James the Great Church, East Malling. Who is He in Yonder Stall ?